Now known as Gaziantep (Veterans Ainteb) in honor of those who drove the last Armenians out of the city. Asbarez / PanARMENIAN.Net - The Ararat Eskijian Museum in Mission Hills, CA, wore the image of Old Aintab earlier this month as fifty or more Aintabtsis and supporters gathered to hear a lecture by Umit Kurt, PhD candidate in the department of History at Clark University, Asbarez reports. The lecture, titled The Emergence of the New Wealthy Class Between 1915-1922: The Seizure of Armenian Property by Local Elites in Aintab, focused on the importance of acquiring Armenian wealth and material possessions to the local Kurds and Turks in Aintab before and during the Armenian Genocide of 1915. As to the lust for Armenian property that could act as a motive for the killings, Kurt described a "link between the role of stolen Armenian assets in the integration and stabilization of Turkification, which makes confiscation of Armenian properties a social process". The fate of the Armenians was not only linked to the Committee of Union and Progress party (CUP) orders, but behavior of the local elites. Material rewards were given for collaboration at the regional level. In Kurt's words, "the large distribution of Armenian property provided a useful incentive that strongly reinforced Armenian hatred and other political and personal issues." Besides the local elites, many other state companies were also involved in the seizure of Armenian properties including auction houses, property assessors, trustees, and transportation companies in support of Turkish anti-Armenian policies in Aintab. The opportunities for success and growth facilitated the removal of Armenians, whereas the effects of the loss of properties to the victims were demoralizing and stigmatizing. Additionally, the deportation of Armenians to the Syrian Desert proved effective in separating them from their properties as they were made not to return. A new local wealthy class emerged and prospered through the obtainment of Armenian wealth and property. After the lecture, Umit Kurt displayed a short film called My Father's Aintab and old and recent images of the Armenian quarter in Aintab. The evening followed with a Q&A session where one of the audience members asked Kurt why he chose to research the destruction of Aintab's Armenians and their properties. As a native of Aintab, when Kurt was younger, he did not know about the presence of Armenians or about the Armenian quarter in Aintab. When one of his friends invited him to a unique coffee shop to meet, his life and interests changed forever. When he reached the coffee shop, he first noticed the intricately carved, monumental front door of the coffee shop and was amazed at the internal beauty and homey design, which contained every feature of an Armenian home. He asked the owner, who was Turkish, to show him around the place and the upstairs section composed of many rooms aesthetically extrinsic to his eyes. Kurt noticed the numbers "1894" (when the first Hamidian massacres took place) on the wall and asked about the previous owner. The man replied, "I don't know, Armenians were here." Later, he discovered that a man named Nazaret Agha of the Kimia family owned the house, before it became a coffee shop. It became the groundbreaking point in his life where he sought out to research the history of the Aintab Armenians and in the meanwhile, also write his own story. Umit Kurt is of Kurdish descent maternally, but is not certain of his father's side. He is a PhD candidate at Clark University and student of Taner Akcam, a prominent scholar on the Armenian Genocide. During the Q&A session, Kurt was asked if he received any objections or had been tried for "insulting Turkishness", in which he responded that he has not yet encountered any objections from the Turkish government regarding his research on the stolen Armenian properties. In the last minutes, Kurt spoke words that made everyone smile. He said, "I don't work for Armenian people; I work for my own people to reckon their own historical wrongdoings." This article contains text with a copyright from Asbarez. Please help us by extracting the factual information and eliminating the rest in order to keep the site in accordance to fair use standards, or by obtaining permission for reuse on this site..
Այնթապ, Айнтап, Ayntap, Այնթաբ, Այնթափ, Անթապ, Անթափ, Անթեպ, Անտիոքա Տավրոսի, Գազիանթեպ, Ղազիանթեպ — Գավառ (սանջակ) և գավառակ (կազա) Կիլիկիայում: Նախկինում մտնում էր Հալեպի նահ–ի (վիլայեթի) մեջ, կենտրոնը՝ Այնթապ ք (այժմ Ղազիանթեպ): 1919 թ Հալեպի նահ-ի կազմից հանվել և Այնթապի, Քիլիսի ու Հռոմկլայի գավ-ների հետ միասին կազմել է առանձին վարչական միավոր: Ա գավ-ի որշ մասը հնում մտնում էր Կիլիկյան հայկական պետության մեջ: Գավ-ի արմ և հս սահմանները Քյուրդդաղի և Ամանոսի միջև հր-հս ձգվող նեղ ձորն է, որը Գյավուրգյոլից երկարում է մինչև Գյոքսուի և Եփրատի միախառնման տեղը: To the easy is the narrow Euphrates (Եփրատ) canyon (ձոր). At the beginning of the 20th century, Aintab kavar (province) had 8 գ-խմբեր Օրուլ, Հեզեք. Ջիքդե, Կզըլ Հիսար, Կզըկ, Չարփն, Թլբաշար, Ռեշ՝ 202, այլ աղբյուրներում՝ 346 գ-երով and 87,000 inhabitants, of which the majority were Armenian until 1915. According to Turkish sources, Armenians were the majority in this region also in the 16-17th centuries. Residents occupations were երկրագործությամբ and animal husbandry. In 1915—1921 Aintab's Armenians were massively destroyed. Those who survived the genocide took refuge in Syria, Lebanon, the United States. Later, some of them repatriated to Soviet Armenia. In a few Diaspora communities, Aintabtsis have their own clubs (հայրենակցական միությունները). 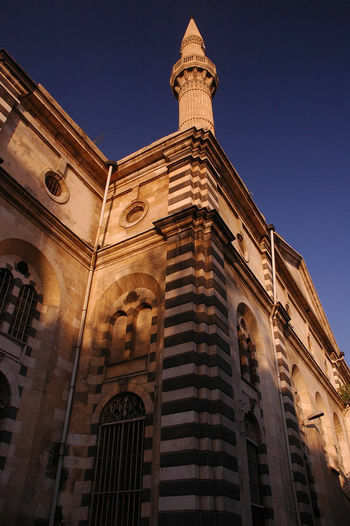 The ‘Liberation’ Mosque is a fine, neo-classical, almost Gothic construction with striped black-and-white stone banding, unusual for a Muslim holy place but a jewel in the Tepebasi district of the old town of Gaziantep. Its stone carvings and mock Grecian columns beside the window frames are a credit to another, gentler age. The minarets perch delicately – and I had never seen this before – on square towers that might have been church towers had there been Christians in this ancient city. But of course, there were. What no-one will tell you in Gaziantep, what no guidebook mentions, what no tourist guide will refer to, is that this very building – whose 19th century builders were none other than the nephews of the official architect of Sultan Abdulhamid II – was the Holy Mother of God cathedral for at least 20,000 Christian Armenians who were victims of the greatest war crime of the 1914-18 war: the Armenian genocide. They were deported by the Ottoman Turks from this lovely city, which had been their families’ home for hundreds of years, to be executed into common graves. The murderers were both Turks and Kurds. Altogether, up to 32,000 Armenians – almost the entire Christian population of 36,000 of what was then called Antep – were deported towards the Syrian cities of Hama, Homs, Selimiyeh, to the Hauran and to Deir Ezzor in 1915. The Muslim citizens of Aintep then apparently plundered the empty homes of those they had dispossessed, seizing not only their property but the treasures of the cathedral church itself. Indeed, the church, ‘Surp Asdvazdadzin Kilisesi’ in Armenian, was turned into a warehouse – as were many Jewish synagogues in Nazi Germany and in Nazi-occupied eastern Europe during the Second World War – and then into a prison. Prowling around the church-mosque enclosure, I found some of the prison bars still attached to the window frames, although the building has been functioning as a mosque since 1986. The main gate was closed but I pushed it open and found not only that the structure of the magnificent building is still intact but that scaffolding has been placed against the walls for a renovation. Behind the church – and separate from the building – was an ancient stone cave whose interior was blackened with what must have been the smoke of candle flames from another era, perhaps a worshipping place because the cave appears to have been a tomb in antiquity. The caretaker came fussing up to us to tell us that the mosque was shut, that we must leave, that this was a closed place. But he was a friendly soul and let us take pictures of the great façade of the church and of the minarets. The only sign of its origin is the date “1892” carved in stone on the east façade of the original church, marking the final completion of the work of the great Armenian architect Sarkis Balian – he was the official architect of the 19th century Sultan Abdulhamid II, a terrible irony since Abdulhamid himself began the first round of Armenian massacres of 80,000 Christians (the figure might be 300,000) in Ottoman Turkey just two years after the Armenian stonemason Sarkis Tascian carved the date on the façade. In the later 1915 Armenian Holocaust – even Israelis use this word for the Armenian genocide – a million and a half Armenians were slaughtered by the Turks. It is a shock to realize that Aintep’s vast toll of dead were only a small fraction of this terrifying war crime. Outside the church, I found an elderly Syrian refugee sitting on the pavement by the closed gate. He greeted us in Arabic and said that, yes, he knew this was once a church. Just over a century ago, the Arabs of northern Syria – the land now occupied by Isis – were among the only friends the Armenians found in the vast deserts into which they were sent to die. Some took Armenian children into their homes. Others married Armenian women – the degree of coercion involved in this ‘charitable’ act depends on the teller — although more than twenty years ago I met a Syrian man and his ‘converted’ Armenian wife near Deir Ezzor, both around a hundred years old and both of whom has lost count of their great-great-grandchildren. A Turkish man in a shop below the cathedral was less generous. Yes, it had been a church, he said. But when I asked him if it had been an Armenian church, he chuckled – dare I call it a smirk? — and looked at me, and said nothing. I suppose a kind of guilt hangs over a place like this. So it is a happy thought that some Armenian families have in recent years – as tourists, of course – visited the city that was once Antep and have spoken with warmth to members of Turkey’s leftist parties and celebrated the work of American missionaries who cared for both the Armenian and Turkish Muslim population here before 1915. One Armenian identified his old family home and the Turkish family who lived there invited him in and insisted that he should stay with them and not in a hotel. For this was also his home, they said. But tears of compassion do not dry up the truth. For when the First World War ended, Allied troops marched into Antep. First came the British, led by the execrable Sir Mark Sykes – of Sykes-Picot infamy – and then the French in October 1919, who brought with them, alas, elements of the Armenian volunteers who had joined their ‘Legion d’Orient’ in Port Said. The Muslim elites who had taken over the town – and the Armenian homes and properties – feared the newcomers would demand restitution. Fighting broke out between Muslims and the French and their Armenian allies and the Muslims discovered a new-found enthusiasm for the independence struggle of Mustafa Kemal Ataturk. Thus began the false history of the city. Perhaps the greatest font of knowledge on this period is a young Harvard scholar, Umit Kurt, of Kurdish-Arab origin, who was born in modern-day Gaziantep. Mr Kurt is now an academic at Harvard’s Center for Middle East Studies and wrote his doctoral dissertation on the Armenians of Antep from the 1890s with a special focus – this is the important bit for readers – on property transfers, confiscation, deportation and massacres. Mr Kurt’s conclusion is bleak. They were successful. The French abandoned Antep in December 1919 and the Armenian volunteers fled with them. 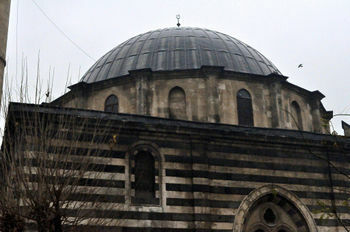 The new Turkish state awarded the Muslim fighters of the city with the honourific Turkish prefix ‘Gazi’ – “veterans” – and thus Antep became Gaziantep and the great church of old Sarkis Balian would eventually be renamed the ‘Liberation Mosque’ – “Kurtulus Cami” – to mark the same dubious victory over the French and Armenians, the latter being defamed as killers by those who had sent the Armenians of the city to their doom in 1915. Not much justice there. Nor in the official Turkish version of that terrible history of the Armenian Holocaust in which – this is the least the Turkish government will concede – Armenians died ‘tragically’ in the chaos of the First World War, as did Muslims themselves. German military advisers witnessed the genocide. Hitler was later to ask his generals, before the invasion of Poland and the destruction of its Jews, who now, in 1939, remembered the Armenians. The official Turkish account of the fate of Gaziantep’s original Armenians refers to their “relocation” – a word used by the Nazis when they sent the Jews to their extermination in eastern Europe. No, we shouldn’t contaminate the Turks of modern Turkey with the crimes of their grandfathers. Umir Kurt wrote his dissertation for the brilliant and brave Turkish historian Taner Akcam, whose work on the Armenian genocide has revolutionised historical scholarship in Turkey. Last year, President Recep Tayyip Erdogan deliberately moved the date of the 1915 Gallipoli commemorations to the very day of the anniversary of the start of the Armenian genocide in an attempt to smother any memory of the crime – but the government allowed Armenians to parade through Istanbul in honour of their 1915 dead. Yet if the historical narrative from the 20th century’s first holocaust to its second holocaust is valid, then the path upon which the first doomed Armenians of Antep set out in their convoy of deportation on 1st August 1915 led all the way to Auschwitz. The ‘Liberation’ Mosque is a milestone on the journey.Prowling around the church-mosque enclosure, I found some of the prison bars still attached to the window frames, although the building has been functioning as a mosque since 1986. The main gate was closed but I pushed it open and found not only that the structure of the magnificent building is still intact but that scaffolding has been placed against the walls for a renovation. Behind the church – and separate from the building – was an ancient stone cave whose interior was blackened with what must have been the smoke of candle flames from another era, perhaps a worshipping place because the cave appears to have been a tomb in antiquity. The caretaker came fussing up to us to tell us that the mosque was shut, that we must leave, that this was a closed place. But he was a friendly soul and let us take pictures of the great façade of the church and of the minarets. No, we shouldn’t contaminate the Turks of modern Turkey with the crimes of their grandfathers. Umir Kurt wrote his dissertation for the brilliant and brave Turkish historian Taner Akcam, whose work on the Armenian genocide has revolutionised historical scholarship in Turkey. Last year, President Recep Tayyip Erdogan deliberately moved the date of the 1915 Gallipoli commemorations to the very day of the anniversary of the start of the Armenian genocide in an attempt to smother any memory of the crime – but the government allowed Armenians to parade through Istanbul in honour of their 1915 dead. Yet if the historical narrative from the 20th century’s first holocaust to its second holocaust is valid, then the path upon which the first doomed Armenians of Antep set out in their convoy of deportation on 1st August 1915 led all the way to Auschwitz. The ‘Liberation’ Mosque is a milestone on the journey. This page was last edited on 29 September 2018, at 04:15.